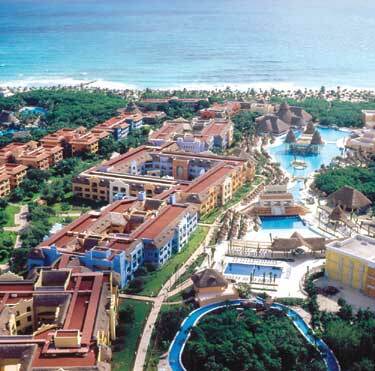 BOOK YOUR Iberostar Paraiso Lindo VACATION ONLINE TODAY! 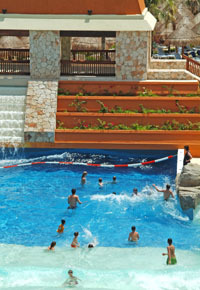 Iberostar Paraiso Lindo Hotel - featuring the only Wave Pool in all of Riviera Maya! Iberostar Hotels and Resorts hold the distinctive honor of being selected "Best Hotel Chain" four years in a row by Apple vacationers! Stay at an Iberostar Resort and you'll immediately see why. Iberostar Paraiso Lindo Iberostar has claimed the Crystal Award top honor for 3 consecutive years and continues to be a repeat favorite. The Iberostar Paraiso Lindo is even more spectacular with 5 swimming pools-two of them lake size pools, a wave pool and a moving river that connects all the pools together. 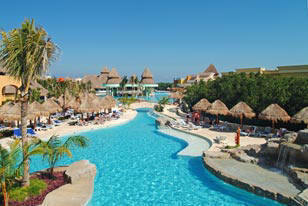 Imagine the fun-body surfing on frothy waves or floating along a winding river that sparkles under a tropical sun. For dining guests can choose from lavish buffets and specialty restaurants with a choice of Italian, Southwest Cajun, Asian and International fare. Or stay poolside at the grill & snack bar. Guests of the Paraiso Lindo are welcomed to enjoy the facilities of sister resorts Iberostar Paraiso Del Mar and Paraiso Beach, giving a total of 14 locations for food and drink, while retaining the privacy of their own resort. 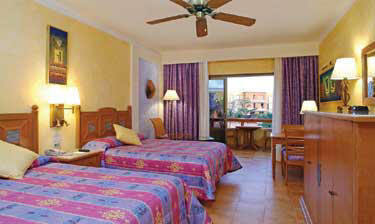 All Iberostar Paraiso Lindo's rooms are spacious and designed with a particular view to detail. They all have terrace / balcony, minibar, marble bathrooms, hairdryer, satellite TV, direct-dial telephone, coffee maker and room service (round the clock). Junior Suite: iron/ironing board, balcony/terrace, minibar, marble bathrooms with phones, hairdryer, satellite TV, direct dial telephone, coffee maker, cosmetic mirrors and 24 hour room service. Standard: balcony/terrace, minibar, marble bathrooms with phones, hairdryer, satellite TV,direct-dial telephone, coffee maker, cosmetic mirrors and 24 hour room service. Luxurious, elegant, newly-built hotel combining spectacular design with the beauty of the Caribbean surroundings. 448 rooms in 3-storey buildings with own central patio. Guests can enjoy 11 restaurants, 9 bars, medical service, hairdresser’s, shops and supermarket, and a convention centre (from winter 2004), amongst other facilities. Magnificent gardens, 5 superb, imaginatively-designed swimming pools (with the only Wave Pool in Mexico), jacuzzi, massage centre, sports courts and large sun terraces (sun loungers, parasols and towels free of charge). Internet corner (extra charge). Aerobics, basketball, exercises, table tennis, tennis, volleyball, windsurfing, hobbycat-sailing and kajaks. Extra charge for: golf course (from 2004/2005), and motorised water sports. Daily Activities: Lighted tennis court, Spanish lessons, dance lesson, water polo, beach/water volley- ball, basketball and ping pong. Lucy's Miniclub offers a variety of activities and children's pool. 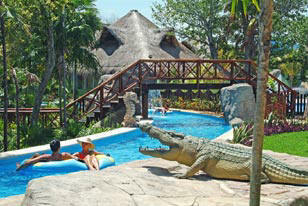 “All Inclusive” service including all meals, entertainment, activities and a great deal more. Our à la carte restaurants include a Gourmet restaurant, and Mexican, a Seafood restaurant, an Oriental restaurant and a Steak House restaurant, all with air conditioning. For dinner please wear formal clothing (long trousers for gentlemen). A la carte specialty restaurant serving dinner (6:30 pm to 10:00 pm) Dress code required. 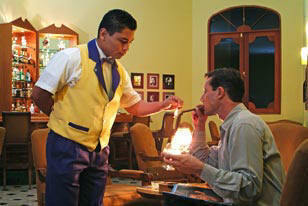 A la carte specialty restaurant serving dinner (6:30 pm to 10:00). Dress code required. Casual pool side restaurant serving lunch, snacks and grilled items throughout the day (11:00 am to 5:00 pm). Main buffet restaurant serving breakfast (7:00 am to 10:00 am ) and lunch (11:00 am to 3:00 pm). A la carte specialty restaurant serving dinner from 6:30 pm 10:00 pm. Dress code required. 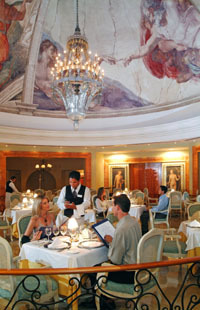 Stay At One, Play At All - Guests staying at the o Iberostar Paraiso Lindo have the opportunity of a "dine-around", which includes all the restaurants and bars of the neighboring hotels Iberostar Paraiso del Mar and Iberostar Paraiso Beach. It includes all beverages (alcoholic and alcohol-free), both nationally-produced and imported. Consult your hotel upon arrival for details and restrictions.